The choice of military and police personnel across the USA. Built to Military and Police standards. Since 1852, the folks at Smith & Wesson have been making high-quality firearms, and they've never stopped innovating. 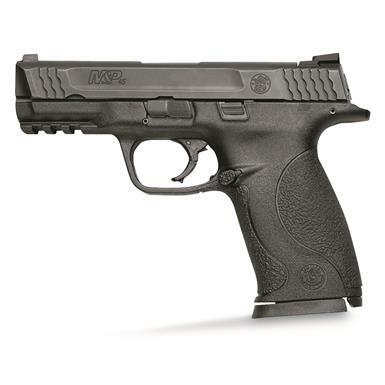 The M&P is another notch in that legendary belt, with low-profile sights ideal for holstering and drawing, polymer frame for reduced weight and plenty more. Smith & Wesson designed the M&P series for Military and Police applications, so you can rest easy knowing it's reliable for home protection and professional duty. NOTE: This particular model is a law enforcement trade-in. May contain scratches and/or holster wear. Some magazines/magazine hold open may not lock properly due to previous wear. Condition will vary. Includes one magazine. There is no guarantee any extra accessories or a case will be included since contents will vary.